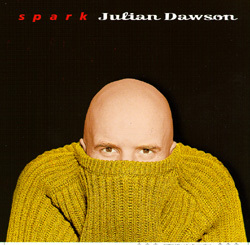 Fierce and fiery, literate and moody, British pop/rocker Julian Dawson makes his Gadfly Records debut with the release of "Spark," a distinctive collection of songs that features supporting performances from Lucinda Williams, Richard Thompson, and The Roches. Julian Dawson makes pop music for smart people. Exquisitely produced and heartfully sung, it's singer-songwriter music gone uptown. Dawson was born to be influenced by American music : his birthday is July 4th (1954). Having spent his early years touring in Europe, it was natural that he was first signed to a record label in Germany rather than in his native England. He made two albums for Polydor and five for BMG, most of which never saw the light of day in the rest of the world. A growing reputation among his colleagues, constant touring and some fine subsequent releases have managed to spread the word - this CD brings a selection of some of the best moments from those albums. If you can judge a man by the company he keeps, then Julian Dawson's reputation speaks for itself...A glance through the credits reveals the presence of some wonderful talents, from Lucinda Williams (who duets on the smoky "How Can I Sleep Without You") to Richard Thompson, The Roches and Steve Forbert. With many of the tracks recorded in the U.S., "Spark" will finally give Americans a chance to catch up on what they've missed. Julian Dawson will continue his love affair with American music and the country itself, supporting the album with concert dates and radio appearances throughout 1999. Meanwhile "Spark" gives an overview of an artist who's music incorporates elements of pop, folk, country and blues mixed together into a melodic and highly individual blend.